An orbital is a region in space where there is a high probability of finding electron. A wave function represents an electron is the product of two parts, a radial part and an angular part. The square of the radial part of the wave function indicate the probability of finding the electron at any distance r from the nucleus. The square of the angular part of the wave function gives the probability of finding an electron in a particular direction from the nucleus. The radial dependence and angular dependence of wave function taken together, tell us that a three dimensional standing electron wave (orbital) can be picture to have size, shape, and an orientation of an orbital. Principal Quantum Number ( n ). The Orbital angular momentum quantum Number or Azimuthal Quantum Number ( l ). The Magnetic Quantum Number (ml ). The Principal quantum Number(n) is of primary importance in the determining the size and hence the energy of an electron. For hydrogen the energy is fixed by the value of n. In other multi electron atom, the energy of each electron depends on the value of the principal quantum number of the electron. As the value of n increases the radius (nucleus electron separation increases that is the size of the orbital increases). The energy also raised, n is always an integer and can assume the value,1,2,3,4.... but not zero. The general geometric shapes of an electron wave (Orbital) is described by the Azimuthal Quantum Number. This quantum number related to for the electron in that state. Therefore an electron having principal quantum number n, assumed the value l is 0 to (n-1). The magnetic quantum number associated with the orientation of the electron wave with respect to a given direction, usually that of a strong magnetic fields. This quantum number hasn't effect on the shape of orbital or on the energy of an electron. For a given Value of l, ml can have any integral value between +1 to -1. Thus, P - type orbital with three orientation in space describe as PxPy,Pz, and d - type orbital with five orientation in space describe as dxy, dxz, dyz, dx2-y2, dz2. Besides the three quantum number a fourth quantum number also has forth quantum number namely spin quantum number (s), Was necessary to completely describe an electron in a particular shell. The electron itself regarding as a small magnet. A beam of hydrogen atom can be split into two beams by a strong magnetic field. This indicates that there are two kinds of hydrogen atom in which can be differentiates on the basis of their behavior in a magnetic field. It has been postulated that each electron spin around it's axis like a lope and they behave like a magnet. A spinning electron can have only two possibilities. The electron can either spin clockwise or counterclockwise. The two directions of spin represent as(↑↓). This four quantum number s = 1/2 is independent of other three quantum numbers. Two direction of spin is represented as (↑↓)s can have two possible ms values +1/2 and -1/2 depending on the direction of rotation of the electron about it axis. The S orbitals penetrate the nucleus most while the P and d orbitals cannot penetrate the nucleus. This means that S orbital electron can efficiently screen the nuclear charge from other electrons compared to the other P and d electrons. The wave function of the electron in atom is called orbital. The wave function is plotted against distance and the space in three dimensional marked by a curve will gives the shape of the orbitals. 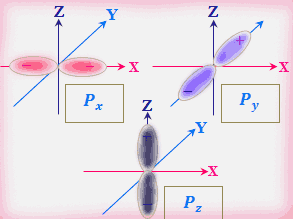 It is not possible to represent completely in one diagram on paper the directional properties of an electron orbitals. An angular probability distribution must be combined mentally to have an overall shape of the orbital. The angular probability distribution are greater interest and importance, an S electron has no angular dependence because the relevant wave function is independent of angles θ and Φ. There is therefore an equal chance of discovering the electron in any direction of the nucleus. Angular probability distribution of S orbital. With the nucleus at the origin of the Cartesian axes, the sphere of the radius r represents the probability of finding the S electron. An S electron has a spherically symmetrical probability distribution. The P orbitals are three orientations is represents as, Px, Py and Pz. The orientations of the orbital plane correspond to ml = 1, 0, -1 are mutually at the right angles. So the orbitals designated Px, Py and Pz are mutually perpendicular and they are concentrated along the respective coordinate axis X,Y and Z. Unlike the S orbitals the angular part of the P wave function is dependent on θ and Φ. The angular Probability distribution are shaped like pears along X, Y and Z axis . Thus in Px orbital it is most likely that the electron will be found in the direction of the X axis. There are no probability of its being found along Y and Z axes. Similar results are obtained for the Py and Pz orbitals. These orbital arises when n =3 (M - shell), that is the orbitals starts with the 3rd main energy level. 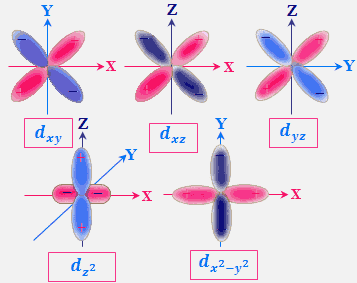 When l = 2(d - orbital), ml = -2, -1, 0, 2, 1 indicating that d - orbitals have five orientation, that is, dxy, dxz, dyz, dx2 - y2 and dz2. All these five d - orbitals, in the absence of magnetic field, are equivalent in energy and are, therefore, said to be five - fold degenerate. 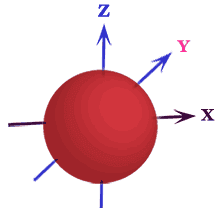 Quantum Number and Atomic Orbitals: Principal Quantum Number ( n ), The Orbital angular momentum quantum Number or Azimuthal Quantum Number ( l ), The Magnetic Quantum Number (ml ) and Spin Quantum Number. Shape of The Orbitals: Shape of S - Orbital, Shape of P - Orbital and Shape of d-Orbital.